One of the joys of the month of May is the sight and fragrance of lilac blossoms. Lilacs adorned the gardens of Versailles and Trianon. They had been great favorites with Louis XIV, and Marie-Antoinette enjoyed them no less in her private domain of Trianon. She liked them so much that, when it came to redecorate her bedchamber in Versailles, a few years before the French Revolution, she chose for the silk drapes and hangings a pattern that included lilacs. The heavy silks with the woven flowers, ribbons and peacock feathers we see nowadays in the Queen’s bedchamber at Versailles are copies of Marie-Antoinette’s tentures d’été, her summer hangings. They would have been replaced in autumn with a different set, presumably in a less flowery motif. The current silks, as in Marie-Antoinette’s time, were woven in Lyon, following the original patterns, which were preserved. 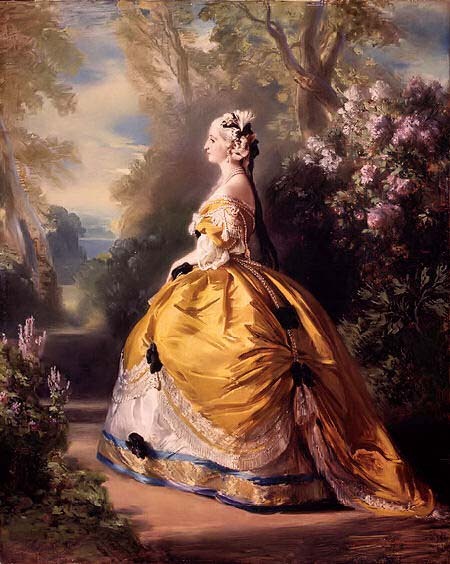 May decades later, when Empress Engénie wished to emulate Marie-Antoinette, whose taste she greatly admired, she had herself painted by Winterhalter in the midst of lilac shrubs.